Dear Reader, I recently trialed a food delivery service where they provide customers with recipes and ingredients for dinners. All the customer had to do was to chop, prepare and cook the items. I was telling some friends about it and one friend didn't quite understand the concept - to her all it did was eliminate a trip to the shops for ingredients which is one of the most pleasurable aspects of cooking. I had to agree with her (although some weeks it is an absolute chore) but mostly I love shopping because I get to see what is available and I then base a recipe around that. I usually buy whatever is good and seasonal at the moment because it is also a great price and that keeps our grocery bill down. 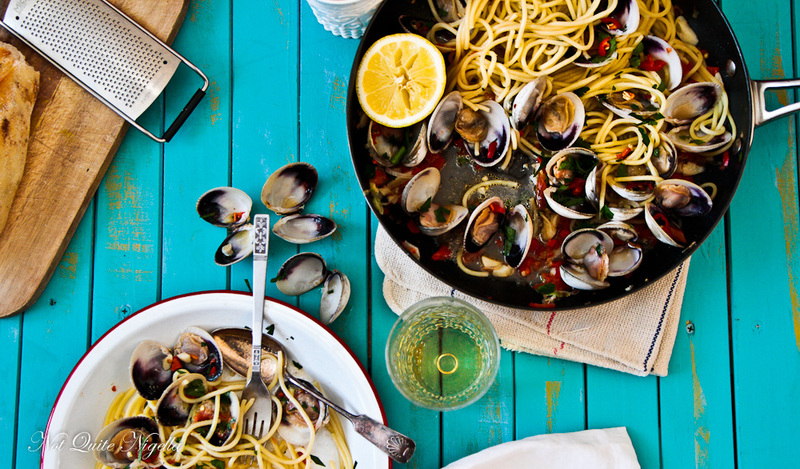 One thing that we eat a lot of is seafood. I'm learning my way around cooking a lot of seafood. A lot of it is "Ooh let's buy this now and then figure out how to cook it. Sardines were one of the most rewarding things in that regard. Now I buy them a lot and I love branching out to cook new things. 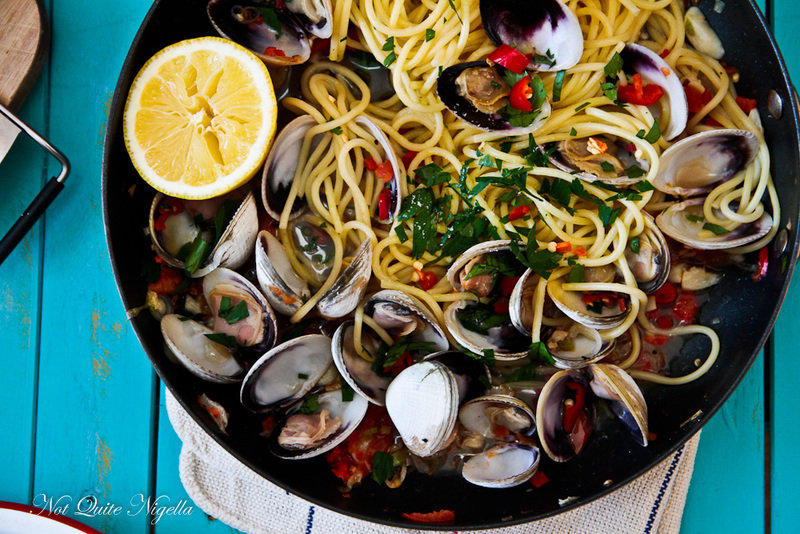 One of those things is clams or vongole, a favourite of mine to eat. 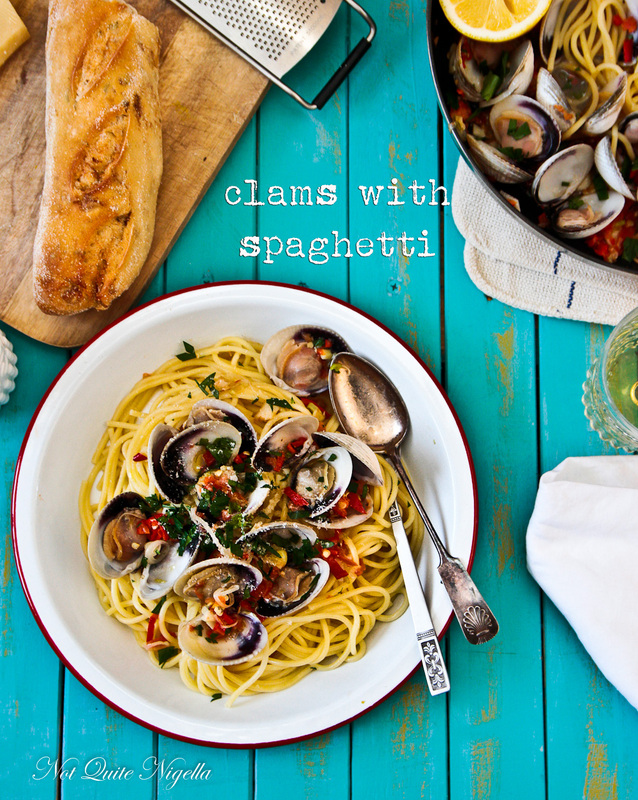 Not only are clams delicious but they're also good calorie wise and if you're thinking about spring coming upon us soon and short dresses that can only be a good thing. For this dish I bought some pre cooked ones that are vacuum packed that come with about a cup of clam juice but you can also buy fresh, raw clams. 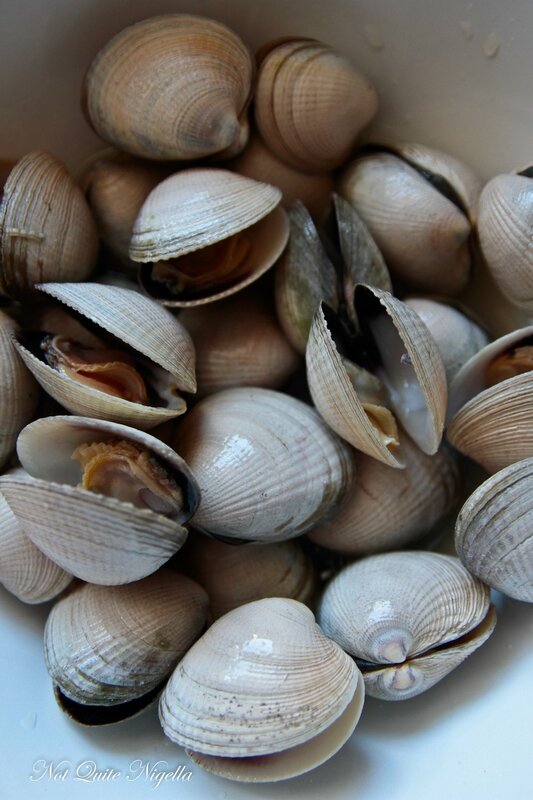 I like little neck clams because they are the most tender and small and oddly enough, I really like their hard shells and if the mood strikes me, I clean and keep them. The larger the clam the tougher but the little necks and small and succulent much in the same way that black mussels are smaller and more tender than green lip mussels. 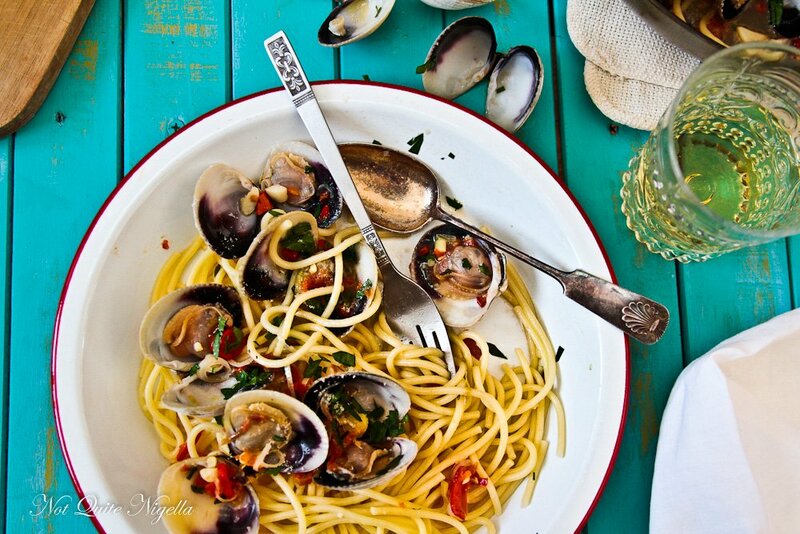 The best thing about this is that it actually takes between 15-20 minutes from start to finish (or 30 minutes if you're steaming clams from raw) and yields a delectable dish with sweet, tender clams, garlic and white wine spaghetti that you could happily serve to guests. 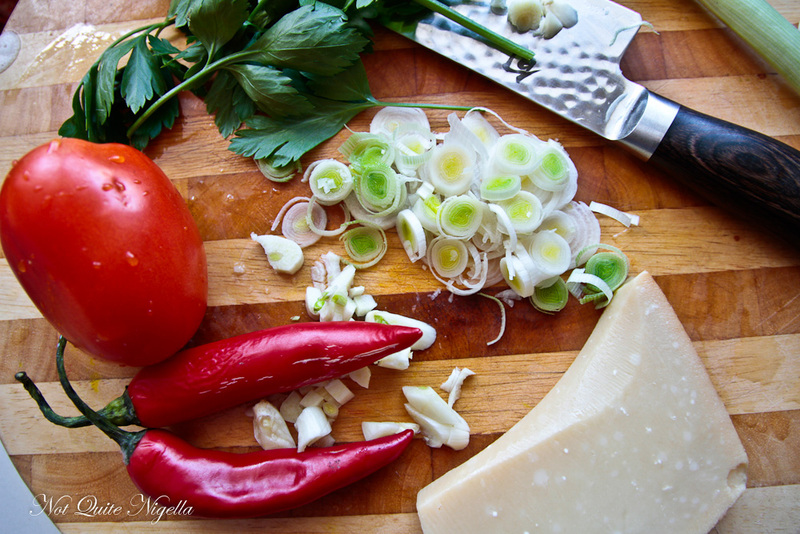 So tell me Dear Reader, how do you choose what to cook? And do you enjoy grocery or market shopping? Would you like a delivery service that delivered you ingredients and recipes? For raw clams: Dealing with raw little neck clams is even easier than mussels because there is no beard to pull out. All you do is take closed clams and scrub the shells if there is debris and then steam over an inch of simmering water until they open. Like with mussels discard any that don't open. Step 1 - Boil spaghetti in plenty of salted, boiling water until al dente. Step 2 - While the spaghetti is cooking, heat the oil in a large saucepan and add the onion and garlic and saute until softened and fragrant. 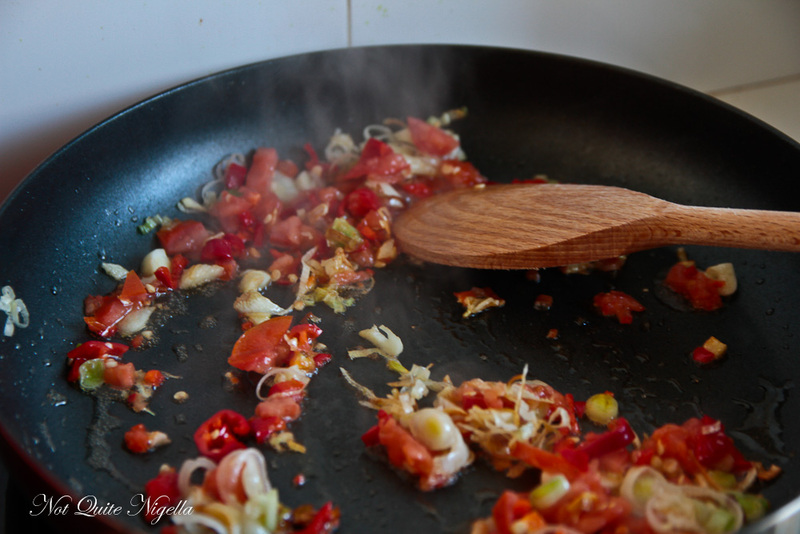 Add the chillies and tomato and saute for another minute. Then add the clam juice and white wine and simmer until reduced -about 8 minutes or so. 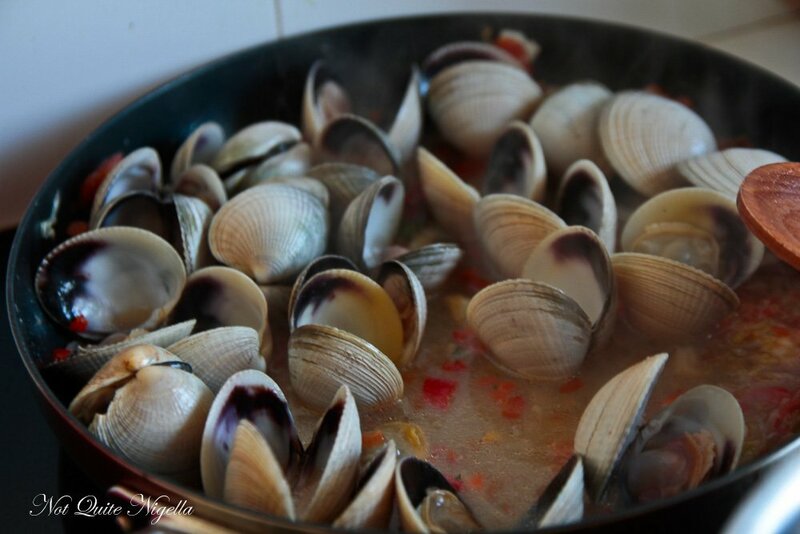 Then add the clams and cook until flesh becomes creamy. Step 3 - The spaghetti should be ready during this time so drain it and rinse it under cold water. Add it to the sauce and clams and toss with tongs. Sprinkle with parsley and season with salt, pepper and lemon juice. recipeCrabdivating Crab & Tomato Butter Spaghetti!